2. Weighing by gross weight type. The unit is compact and easy to install for effective use in confined space. The most economically effective weighing and packing system. 3. Suitable for good flow material, like as rice, feeds, wheat, corn, beans, pesticides, plastic pellets, pills, granular fertilizer, grain and so on. 4. 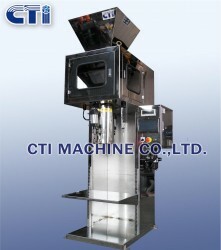 Machine is equipped with Japan brand's weight indicator and load cell. Weighing method is by free falling and maintain easily. High accuracy and weighing speed. 5. Pneumatically driven, human-machine interface and PLC control system is equipped. Automatic detection is provided for malfunction detection. Troubleshooting is automatically shown on touch screen. 6. Depending on weight of product package, multiple settings can be saved in memory. 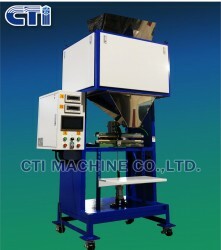 The machine provides display of accumulated weights and number of bags packed for easy operation.